WATERLOO – A Wilfrid Laurier University associate professor of Spanish has been named one of this year’s 10 most influential Hispanic Canadians. Mercedes Rowinsky-Geurts, an award-winning teacher and extensively published researcher in Laurier’s Department of Languages and Literatures, received the honour at a gala Nov. 21 in Toronto. The award was presented by the Canadian Hispanic Business Alliance in partnership with the Canadian Hispanic Congress, TD Canada Trust and a number of other sponsors. The awards recognize influential Hispanic-Canadians from across Canada, representing a wide range of fields of endeavour. Since 2007, the awards have recognized 100 people in seven provinces, representing 17 countries of origin. They have included artists, researchers, community advocates and professionals. 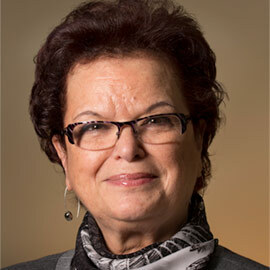 Rowinsky-Geurts, who joined Laurier in 1994, was an early pioneer in developing technologized active learning classrooms at Laurier. In 2008, she won a 3M National Teaching Fellowship, Canada’s most prestigious university teaching award. She has received and been nominated for a long list of other teaching awards. She has also won awards for textbook development, research, translation, literary criticism and poetry. Rowinsky-Geurts knows hard work and perseverance from personal experience. She was born and raised in Uruguay and became an elementary school teacher. In the years that followed a 1973 military coup, many of her friends were persecuted for opposing the dictatorship. She and her family decided to leave. There was a lot to get used to in Canada when she arrived in January 1976. Though she had studied English in Uruguay, speaking it every day while negotiating a different culture was difficult, and her studies in Uruguay were not recognized. As a single mother in her 30s, Rowinsky-Geurts started studying for a Canadian bachelor’s degree with the goal of requalifying as a teacher. To support her children, she worked nights, running her own small business cleaning offices. Despite the hard work, Rowinsky-Geurts found she loved and excelled at her academic studies. After completing her bachelor’s degree, she decided to continue on to a master’s, then to a PhD. She began teaching Spanish at Laurier in 1994, during the last year of her doctoral studies. In 1997, she secured a tenure-track position.